Vic's sister, Joy, shared this photo in a blog post and it knocked the wind out of me. I cried over Lucy like I haven't in a long time. It scared me, but it was also healing--in a way. It made me realize that in my joyful living I am honoring her, but in my pain I feel connected to her. Which leads me to ask--which is more important? Honoring someone or connecting with them? And how can you do both at the same time? Is that why we have two sides to our brains? A body and a spirit? Memories and the present moment? This statue is in Slovakia. It was created for all the unborn children in that country. When your daughter dies and you think you are starting to heal -- you are. You are healing. As much as someone whose broken heart struggles to beat on the outside of their body can heal. But when your daughter dies the pain can hit you out of the blue at anytime, for any reason. The fact that you live each day without her is reason enough. And when your daughter dies it defines you. But you wouldn't want it not to. Sometimes the only thing I want people to know about me is that my daughter died. Nothing more. When your daughter dies you live in a dream world. Aware that you are "doing MUCH better", thriving even, but constantly aware that she is not there. The good times aren't so much "good" as they are triumphant. Because enjoying yourself, feeling at peace, having fun...those aren't your run-of-the mill emotions you experience easily after your daughter's death. They are hard earned rewards for having HOPE. When your daughter dies you understand what is really important in life while not understanding life at all. When your daughter dies you don't fear or fight getting older. You embrace it and have the ULTIMATE gift to look forward to in the next life--while simultaneously wondering and struggling with living your everyday life on earth and how you will possibly make it. But even if your daughter doesn't die before you--life is still hard. I don't plan on ever figuring it out. But I plan on continually improving through love of learning, love of others, love of self, love of nature, and strengthening my balancing act skills so I'm able to honor and connect with my daughter in another world without falling off the tightrope. I have no idea if any of this made sense. But a flood of emotions washed through me when I saw this photo and this was the best I could do to put them into words. What an absolutely, stunningly, beautiful sculpture. Captures the essence so perfectly. I always say it's like getting kicked in the stomach by a horse. You so don't expect it and it hurts so bad. I hate those days and yet I think they are good for me. That sculpture is breathtaking. Just exquisite. And so are your words, shared here. I love that statue. Thanks for sharing. I looked at it for a long time. I couldn't agree more with this post. And I couldn't help but think, for you, that statue now represents two little girls watching over you. Lucy and that little babe on her way. Sending love your way. Thank you for sharing... I shared your post with Sherie... @ http://rememberingnatalie.blogspot.com/ She lost her daughter September 24, 2003. I don't know which is better honoring or connecting... but I am sure that it is necessary to do both. I have read your blog for a while. My sister shared your other blog with me first and I was amazed at all you have been through and all you are doing to help & serve others. I check your blog often & look forward to reading about all you are involved with, but I must say- this post is my favorite!! It is beautiful and It is inspiring. I can't imagine your loss. I can't imagine not having my children by my side on this earth with me. I don't know your heartache. But I know my own heartache. My mom died after a brief battle with cancer. Your words made perfect sense. I am so glad you share your story and your journey. thanks for sharing. YOU are beautiful. and so is your Lucy. When your daughter dies...everything you wrote makes Perfect sense. Molly You have let it define you in such a beautiful way. I look up to you in so many ways! I love that picture! Thanks for sharing your thoughts. I too love that picture, when I first saw it brought so much peace to me, losing a child so young is one of the hardest things a parent will ever face. It’s so un-natural to do so, and yet there are so many of us that have. LOVE your blog, LOVE your program of providing marker’s for families. I know that for us, it’s been harder to find the money for a headstone for our 4th Angel (son) and programs like this, WOW!, Thank you for sharing. I just spent some time trying to really just be with you from afar. And mostly, it just silences me. I am as sorry as ever, and honor you as ever, too. I love this. I, too, am crying like I haven't in a long time. Thank you for sharing your thoughts and feelings. Love you. I am not sure if I should even comment on here but here goes. I have not lost a child, honestly I don't know how you and many others continue to go on after such a horrific tragedy. I am so sorry for your loss, Lucy was and is beautiful and I am greatful that you have the knowledge that you WILL be with her again. Something that you said really hit me. The part where you said, "But when your daughter dies, the pain can hit you out of the blue at anytime, for any reason. The fact that you live each day without her is reason enough." I loved this. My sister died when I was 12, she was 14, so for 21 years I have missed her and grieved her loss, and watched my amazing parents handle it all somehow. I don't know why but this year seems to have been the hardest year so far (for me) My sister died in a river, and we found out on the side of the freeway that she was missing and presumed dead. Her body was not found for 2 days. Like I said earlier, for some reason lately all I can hear is my mother's scream as my dad told her what had happened. I just can't seem to get it out of my head and I can't talk to my parents about it because I know that their grief is so much deeper then mine, I would hate for them to have to comfort me when it was THEIR child that is gone. I have been very bothered by the fact that this is affecting me so badly so many years later. For whatever reason, that statement you made has given me a sense of peace. I am in awe of the way that you have handled your loss. You have turned such a tragedy into so many blessings for other people. Thank you for being so honest and sharing your feelings so openly, it is HELPING so many. You always pull my heart strings. Beautiful words and exactly how I felt this past weekend as yet another wave of grief and missing hit me out of the blue. Thank you for putting your thoughts and feelings down. I have been a whole bundle of hormonal thoughts and emotions and wanting to make sense of them and thinking about Lucy so much lately. When I saw the photo I just bawled. I saw YOU and Lucy. And then I guess it kind of made sense what I was thinking. I wondered what you would think when you saw the statue too. Oh and I meant to ask or say... don't you think you do BOTH- honor and connect as you LIVE and MOURN. You do both of those at the same time. Maybe it doesn't feel the same in your mind and heart... but I wonder if it does in hers? I feel the same way. Those days are so hard, but I too feel like I need them. Thank you for sharing your thoughts and feelings. it made perfect sense. :-) You sure do have a way with words. I saw your link through Blogher and had to come read it. So beautifully written. I'm so sorry for your loss and I think that you have a beautiful family. We lost our little daughter too, a few years back and everyone you wrote here makes so much sense. The sight of that picture preceded my tears by about 1/8th of a second. I think I understand exactly what you have said here. In ways I can't explain I understand exactly I think. Even if I don't, I'm glad you had those feelings and that you expressed them. I'm glad it struck something in me that was powerful, if painful. The best thing I know about your daughter, besides that she died, is that she lives! God bless you! Do you know where one of these can be purchased? SO beautiful, what a sweet post. I didn't lose a daughter but I lost a son. It touches you just the same. I love the statue and the post. You are continually validating me with your insights and honesty. Thank you. I am bummed we missed you this weekend. I miss you. my daughter died too. and your post made perfect sense to me. Beautiful statue. Simple, yet it says so much. I am from Slovakia actually. I read your blog often and I'm sorry I'm not reading a different story when I tune over here. I'm very excited for your family to get bigger soon. I bet you are going to enjoy having a little sweet girl in your home again and I know that Peter is going to be the best big brother to her :). I too came here after seeing the picture on Pinterest. 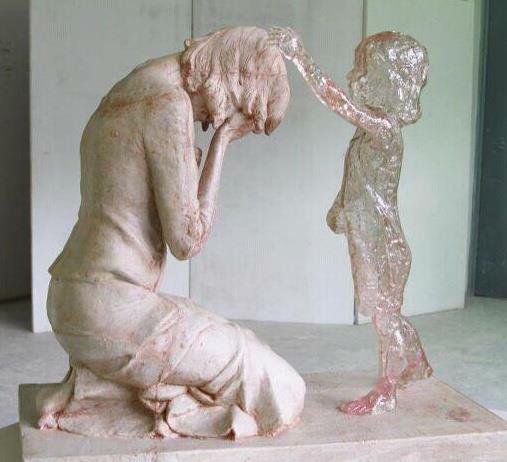 What a beautiful sculpture and a beautiful tribute to your daughter you have written. I am so very sorry for your family's tragic loss, though words aren't nearly enough. My own angel daugther might have been graduating from high school this spring but didn't live long enough to leave the hospital nearly 18 years ago, after being born 3 months too soon. As the local radio and TV starts covering prom season and is beginning to discuss graduating seniors, it's brought up some unexpected emotions. I remember well the feeling you mentioned of sometimes people needing to know that I had a daughter who died being the most important thing there was to know about me. I've often said over the years as I've met others who've been through this (regardless of the circumstances), that it's a sorority no one willingly joins, yet when you find yourself in this position, there are some things that only another woman who has been through it truly understands. I was fortunate enough that the social worker in the NICU at the hospital was initially this person for me and there to celebrate with us when a couple of years later we had a son (nearly full term), and also helped me to deal with the emotions I felt at the time of "This is what I missed with her". Hopefully you have found that person in your hometown or family for support. Is there any way to buy one of these, but have it be about when your son dies? My wife lost her 1st child when he was only a week old, and this would be great to give to her. Granted it's been 12 years now, but I know she would LOVE this. I lost my daughter in September. 22. My only child. I'm trying to work, but sometimes I am so distracted. I appreciate what you wrote. I am constantly searching for ways to handle this. Its unbearable. I feel very vulnerable at times. One thing you said in particular rings true. All you need to know about me is my daughter died. My 22 year old Daughter died in September. So much of your post touches my heart, and rings true. Every day I hear her voice and feel her presence. I write posts to her on Facebook. Just putting it out there. I don't believe in "closure". I am greatful for my clarity in recalling and reliving all the moments of her life. I speak of her in the present, not past tense. I believe in eternal life, filled with love and joy. I know we will be together always. No matter what dimension. Absolutely beautiful. Those words ring so true. I lost my youngest son. This is EXACTLY how I feel. You expressed yourself beautifully. Thank you.